June is National Microchipping Month and the ideal opportunity to get your cat microchipped, if it isn’t already. Microchipping is the most effective way of identifying a lost pet – microchips are permanent and can’t come off like a collar. Each microchip has a unique ID number which is stored on a national database. If a lost cat is found and the chip is scanned, it will then reveal the owner's name and address from the database's records and the cat can be reunited. Cats Protection is a member of the Microchipping Alliance which campaigned to make microchipping compulsory for dogs. Thanks to this work, all dogs in England will have to be microchipped by April 2016. We also raise public awareness of the benefits of microchipping to cats and other companion animals. We’d like to see regulations to introduce compulsory microchipping of all owned cats. As well as helping to reunite lost pets with their owners, microchips are also useful for identification in and around the home. 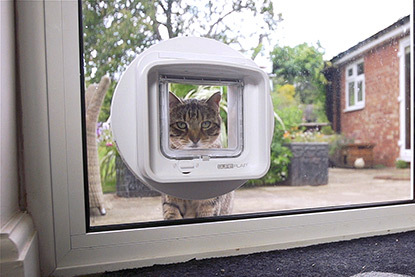 The SureFlap Cat Flap, for example, helps to stop intruder cats from coming into your home as it’ll only open for programmed microchips. 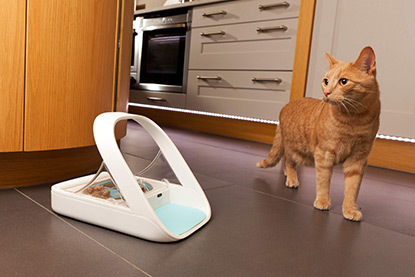 Similarly, the SureFeed Microchip Pet Feeder will only open when it recognises the correct cat’s microchip and then closes when they have finished eating. This makes it ideal for cats on special diets or on medication as it stops other pets from eating their food. If you are looking to buy a cat flap or microchip feeder, why not purchase it through SureFlap and support Cats Protection while doing so? Visit www.sureflap.com and enter the code CP20 in the discount box at the checkout. The code will give you a £5 discount off the Microchip Cat Flap, £6.25 off the DualScan Microchip Cat Flap, £7.50 off the Microchip Pet Door or £7.50 off a Microchip Pet Feeder. For every feeder sold SureFlap makes a donation to Cats Protection.